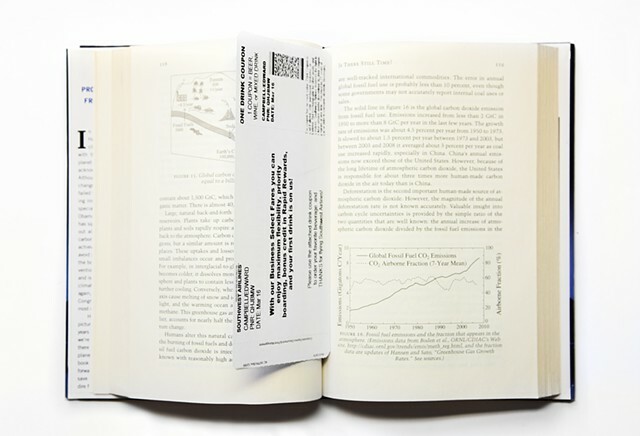 An airline tickets was found inside this book by noted climate scientist and former head of NASA James Hansen—perhaps used by the book's former owner as a bookmark while reading Hansen's urgent warnings on an airplane. A round-trip flight from New York to Europe or California creates a warming effect equivalent to 2 to 3 tons of carbon dioxide per person. For many urban-dwellers, flying is by far their largest contribution to planetary warming. Flying has become a normalized and important part of many people's lifestyles, yet the need to reduce emissions is inescapable. A carbon tax would create a true cost model where people wealthy enough to fly also paid for the emissions they created, instead of externalizing these costs onto the biosphere and the developing world. A carbon tax on airline emissions and would also encourage telecommuting, accelerate the productions of more efficient airplanes and cause people to be more thoughtful about the flights they take.